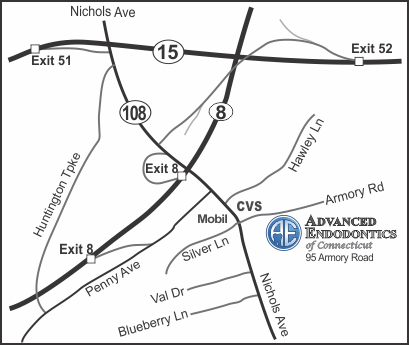 Our central Connecticut office is located on Route 5 in Meriden, adjacent to the Meriden/Wallingford town line. It offers easy access from the Merritt / Wilbur Cross Parkway (CT-15), I-691 and I-91. 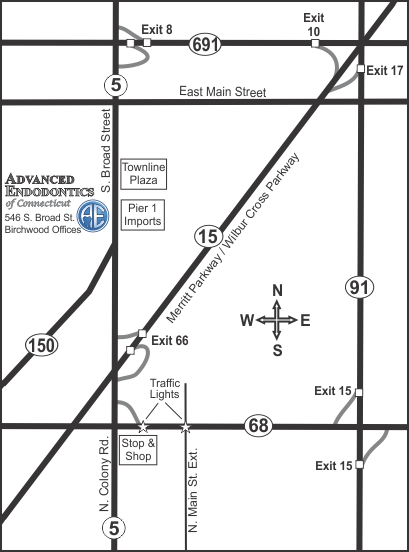 Our southern Connecticut office is located on the Stratford/Trumbull town line near Hawley Lane. It offers easy access from the Merritt Parkway (CT-15) and Route 8. We offer two locations for convenient access from most of central and southwestern CT.
Our regular office hours are Monday thru Friday from 8:00 AM to 5:00 PM in both offices. On weekends & holidays, one of our offices is always available for emergency root canal treatment.